Citation Information: J Clin Invest. 2012;122(8):2763-2764. https://doi.org/10.1172/JCI64587. In the 1960s, my lab was interested in understanding how bilirubin and other organic anions are transferred from the plasma through the liver cell and into the bile. We performed gel filtration of liver supernatants and identified two protein fractions, designated Y and Z, which bound organic anions including bilirubin, and thus we proposed that they were involved in hepatic uptake of organic anions from plasma. 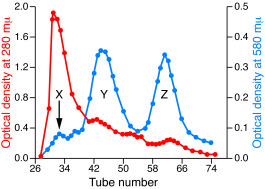 Subsequently, the Y and Z proteins responsible for this binding activity were purified, cloned, and sequenced. Y was identified as a member of the glutathione S-transferase (GST) protein family and Z found to be a member of the fatty acid–binding protein (FABP) family. These proteins have since been shown to have additional surprising roles, but understanding of their full role in physiology and disease has not yet been achieved. In 1969, my group used gel filtration to fractionate soluble proteins from rat liver. The components of the Y and Z fractions have subsequently been implicated in several hepatic functions, including organic anion uptake, cell signaling, metabolism, and carcinogenesis. Reproduced from ref. 1.